God's Trigger, Techland's new co-op title, was announced earlier this week at Gamescom, and folks have finally gotten some hands-on time with it. 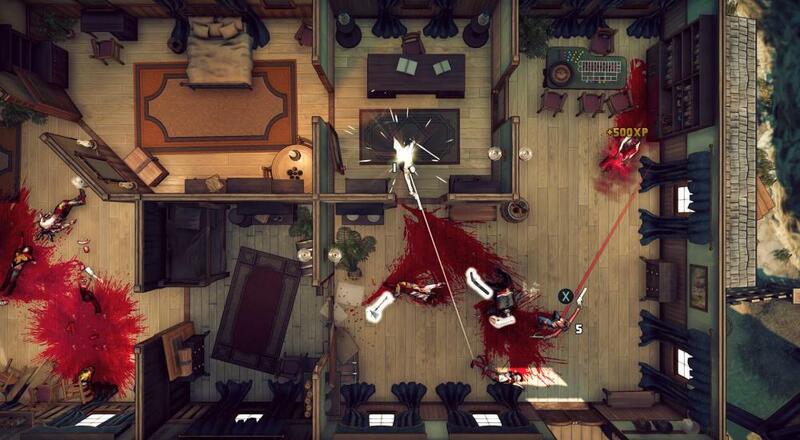 Most descriptions are lauding it as a "co-op Hotline Miami," which sounds alright to me. The setup to this twitchy shoot-fest is that an Angel (Harry) and a Demoness (Judy) have to team-up in order to save humanity from the Four Horseman of the Apocalypse. The same "one hit you're dead" mechanics from Hotline Miami apply here, so when you and your co-op buddy are clearing rooms of bad guys you'll have to be quick to get them before they get you. Each player will have access to some special abilities (like teleporting across a room or hurling scenery at enemies), and you can also revive a downed teammate, but it sounds like the action is fast and furious so you'll have to choose your moments carefully. No release date is slated for God's Trigger, but it should be out sometime next year for the PlayStation 4, Xbox One, and PC. Two player local and online co-op will be supported throughout the campaign. Page created in 1.1215 seconds.